Former LB, Brandon Hepburn is prepared for this year’s NFL Draft. After recently attending the NFL Scouting Combine, he is waiting for his name to be called this Draft Day. Brandon Hepburn, originally from New York, was a preferred walk-on at Florida A&M University at the start of Coach Joe Taylor’s tenure. He made an impact during his junior and senior seasons at FAMU and is considered to be a late round selection in the 2013 NFL Draft. He is willing to play Special Teams and understands it, just as well as anybody. Enjoy our exclusive interview. Click here to download the audio interview with Brandon Hepburn or scroll down below to read it. Announcement : Brandon Hepburn, originally from New York, came down to Tallahassee to play at Florida A&M University. He was a contributor and a team player from the moment he had a chance to show new head coach, Joe Taylor, what he was capable of. He totaled over 150 tackles and over 7 sacks in his collegiate career as a linebacker. He is a sleeper in this upcoming 2013 NFL Draft after contributing at numerous games on Special Teams. Enjoy our interview. 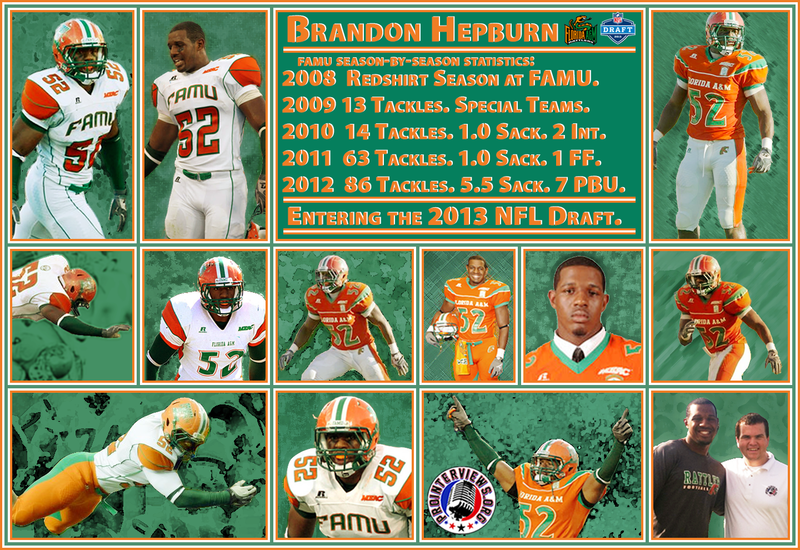 This is Brandon Hepburn, linebacker out of Florida A&M University, and you are now listening to www.ProInterviews.org. Max Strauss : How do you connect with your fan base? Brandon Hepburn : I just try to stay within the community. Especially around school, I always want to spend time out there with other people. We try to show that FAMU athletics is definitely involved in the community. We did a couple of different things together, as a team. We had a couple of fellowships out there such as “Save Our Sons.” It was a day where the kids came out and we ran them through some drills. It was myself and some of my teammates. I also was part of the “Homeless Ministries Shelter.” The shelter is off of Tennessee Street in Tallahassee, (Florida). What we would do is… We would go by, and I would help with the food preparation. And we would minister to those who had a little less than us. We have been going out there and hanging with people, and just being with them and talking with them, and we’d play board games and things like that. Those are some of the things that I would do to stay active within the community. Strauss : When did you start playing football, and what position did you play growing up? Hepburn : I started playing football in third grade. I actually played guard at the time. I played guard and linebacker, and shortly after that, I played fullback. And then, I played fullback and linebacker all the way up through my senior year at high school. I played some defensive line during my senior year too. Strauss : More into high school football, what was that experience like for you? Hepburn : It was great! I got to play with some really great guys. A couple of my best friends to this day are still some of the guys that I played with in high school. It was fun! Playing football in New York is different… It’s really different… Our high school happened to take football very seriously. So, it was great to have the coaches to teach you, and good guys to play alongside, so it was a fun experience. Strauss : What do you think was the biggest challenge that you faced growing up? Hepburn : I think the biggest challenge I faced was my grandma’s death. My grandma and I were really close, and when she died, it took a toll on me. But God will help me get through that certain time and situation in my life. I kind of use it as a fuel in my fire t o make sure that I was doing things that were going to make her proud. Strauss : Tell me about your sister, Yvana because she’s older than you and an athlete as well. When you were playing high school football, did you learn from her? Did you train with her at all? Hepburn : Not exactly… I didn’t train with my sister a lot. We had times when we would lift together, and different activities and stuff like that, but it wasn’t on a regular basis. I really trained with some of my friends and teammates in high school, and we grew close through it. But my sister and I, we’re close to this day. She would teach me some running mechanics and different things of that nature. Strauss : What was your whole recruiting experience like? Hepburn : It was interesting. A lot of Division II and Division III schools wanted me. I had some opportunities with some Division I-AA up here with Albany and Cortland, but I made my decision to come to Florida A&M, and I haven’t looked back since. Hepburn : Not too many sports down south recruit very heavily in the northeast. I don’t see a lot of SEC guys come from New York, New Jersey, New England or any place like that. It was in the guidebook that I was coming to FAMU. I actually got offered an academic scholarship. So I came down there in 2008, and I was seeking to make that complete with an athletic scholarship. When I was speaking to the last head coach at the part of the program, coach Rubin Carter, which was during the 2005 to 2007 games, but unfortunately, by the time I came down for my visit the entire coaching staff got liquidated. But Coach Joseph Taylor who was the head coach from 2008 to 2012, he happened to bring in a lot of guys that he had at Hampton, which was his previous college. I was a preferred walk-on. So I came onto the team, and that next semester, I was able to earn myself a scholarship. That was a good experience, It was something that really taught me how to persevere. Strauss : What was your first experience like meeting Coach Taylor? Hepburn : Coach Taylor is a really great guy. He really has a lot of good sayings and tries to instill discipline into his players. Him being that type of head coach, it was good to learn under him and take what I could from him. Strauss : What was the most important thing you learned from him? Hepburn : Discipline, really. The number one thing I learned from Coach Taylor was to be a man of your word, and to follow through with the things you said yourself. Strauss : Can you give an example of how he did that? Hepburn : That was something I picked up through my whole journey with him, being my coach and me, being a player. Seeing how he would interact with the players and seeing how he would interact with the coaches, it really helped me to understand what being a good leader really meant, and what it required. Strauss : You red-shirted as a freshman and played Special Teams and everything, and then you moved your way slowly into a starting role. What was it like to train throughout those off-seasons? Hepburn : Of course, when it comes to any sport, or when it comes to anything you want to do in life, you have to pay your dues. I really had no problem with that. I love Special Teams, you get to hear it, you get to go out, and make tackles. I never really minded that at all. And, I know going into this next phase, I might have to do the same thing again, and that’s fine. I am one of those guys that really loves this game, and I’ll do whatever it takes for the team to win. If that takes switching my position, or if that takes playing on Special Teams, I’m all for it. The goal is always a championship and to do your best towards the campaign of winning, and so I can play for the team. Strauss : Being from FAMU. Most people don’t understand that you get to play some pretty talented teams every year. What was it like going against those guys…like a Florida State or University of Miami…to progress your career? Hepburn : We actually went against the University of Miami for two years, and then we went against the University of South Florida in 2011, and this last 2012 season, we went up to northern Oklahoma and went against the University of Oklahoma. I’m a big believer that it’s not about the school, but it’s about the player. I don’t think a school makes the player, but a player makes the school. I just took that approach coming into those games, and I really just did my best. It was fun. It was different environments to go into, and it was a good experience. It was definitely something I will remember. Strauss : Did you play Special Teams in your senior season? Hepburn : Yeah. I played Special Teams this year. I played punt and I played kick off. Both look the same, but being a leader out there on the field…really, I try to play on both. Strauss : You started playing Special Teams. How important do you find playing Special Teams as a way in for you? Hepburn : I think if you win two of the three phases of football, you’re going to win the game. Special Teams is where a lot of the big plays and big yardage exist within the game. That entire aspect of football is extremely important. I understand that. I do what the team calls me to do. Whatever I need to do for the team to be successful, that’s what I’m going to do. Taking that approach going into FAMU or going into this next level, if I’m called on to, if they say Special Teams, I’m going to be the first in line. I’m going to do what’s necessary to win. Strauss : Do you have a favorite tackle or sack in your career? Hepburn : I think my favorite hit might have been against North Carolina Central at our homecoming this past year to seal the deal for Coach Holmes first win as our head coach. That definitely meant a lot. With Coach Holmes being a mentor of mine, and my defensive coordinator and linebacker coach for so long, it really iced the deal for us at that game. That definitely would have been one of my favorite plays. Strauss : At FAMU, you did stuff outside of football. In terms of academics, you were part of the National Honor Society, the Science Honor Society, how important do you find academics to you, and why is it that see players unfortunately have a stereotype that they’re “not smart guys.” Explain to me separating yourself from that stereotype. Hepburn : I think that stereotype is very provincial because the guys that I played with majored in everything from engineering to architecture to biology to pre-med to pre-law and all things in between. So I don’t think a lot of players at my school kind-of fit that mold. Being one of those guys majoring in biochemistry, everybody has to be major at something, so I chose to go for what I really love. I love the way God created the body, and I wanted to learn more about it. That’s why I chose the major I did. It wasn’t easy, but it was rewarding. There are thousands of college football players across the country, and all of us got to major in something besides the field. Knowing that I wanted to do something that really would pay off in the end. Strauss : So, if a team called you up on draft day and said, “Why should we draft you?” What’s your best answer for them? Hepburn : I believe that given the skill set that God has given me between my size, my speed, and my wisdom of the game, I could be an asset for any organization. I believe that through what I have learned at my school, and through things I have done on the field, that I can make a smooth transition into the professional ranks. I take my job very seriously. My entire goal is to be a professional at what I do. I believe that any team that’s looking into the business of a linebacker, I can definitely fit that mold. Strauss : If a scout asks you to compare your game to someone in the NFL today, who would you choose and why? Hepburn : I would say some people that I definitely emulate my game after have to be Patrick Willis and Ray Lewis. Of course Ray Lewis is definitely a huge inspiration to me to play the game in the first place, and one the reasons why I the number, 52. Strauss : How on the field do you compare to them? Hepburn : Because I try to diagnose plays quickly. I know this game is a thinking man’s game. I try to make sure that I make plays as quickly as I can in the backfield, and play with the intensity and passion that any linebacker should play with. Strauss : These past few months after the football season you’ve been training for the combine. What was that whole process like? Hepburn : Training was a little different. It was high intensity, but I trained with a great trainer with Pete Bommarito, out of Miami. It was a great experience to be around some of the guys that really were focused and driven. to see their dream materialize into a reality. Strauss : What was the combine like for you to actually attend it? Hepburn : It was a different experience. It was very fun getting out there and competing at such a high level with so many guys with a lot of energy and a lot of motion. It was kind-of like the game of football, and all eyes were on us. It was a huge opportunity for me to able to go out there and try to turn some heads, try to get the attention of some coaches, and try to get the attention of some scouts. God is good, and He allowed me to some great things out there, and I was able to do even greater things at my Pro Day. It was an awesome experience and I’m just grateful and thankful that I had the opportunity to go up to Indianapolis and compete. Strauss : If you could describe yourself as any ice cream flavor, what it would be and why? Hepburn (Uncut) : (Laughs) Any ice cream flavor. Wow. Okay… I would say vanilla bean. Why, because it’s my favorite, its reliable, its dependable, and it never changes. Strauss : You’re pretty sharp to come up with that answer so quickly though. Seems like you’ve been asked that before. Hepburn : No, I just gotta think of my feet, man. When it comes to interviews, I just try to roll with the punches. Strauss : For someone who wants to play football and hopefully one day make it to the NFL and go through this whole process that you’re going through, what’s the best advice you can give them? Hepburn : I would tell them to just take advantage of the moment. To seize the moment… carpe diem! The word says that there will be a time because “time waits for no man,” and to “take advantage of every opportunity because the days are evil.” Those are some of the things that I would tell somebody if they are in a predicament like mine coming up into the future. Just go out there and make them most out of each opportunity that God gives you, and never have regrets. Do the best you can and put it all out there, and see where the chips fall. Strauss : Do you have a favorite quote, or something you live by? Strauss : That’s it, really, thanks so much for your time Brandon, I really appreciate it. Hepburn : Alright, thank you! I appreciate that. Announcement : Thank you for listening to the interview with Brandon Hepburn. Please check out www.prointerviews.org for more interviews, “LIKE” our Facebook page at www.facebook.com/ProInterviews, and follow us on twitter at www.twitter.com/ProInterviews. Make sure to connect with us to stay updated for more interviews.